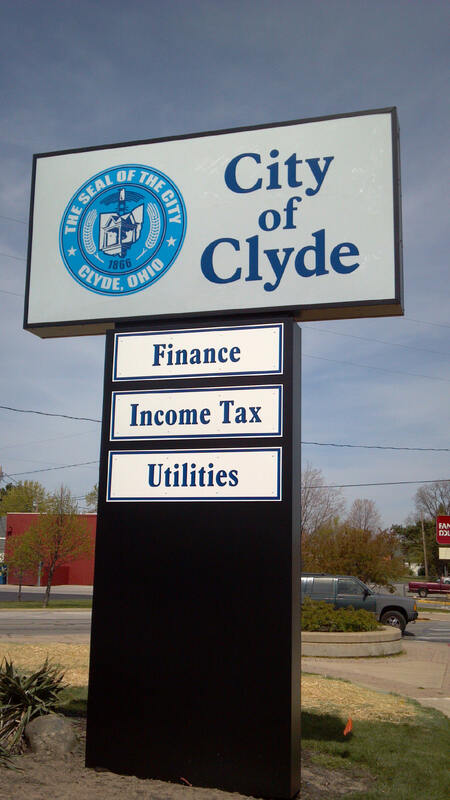 The current City of Clyde income tax rate is 1.50%. Per Am.Sub. HB 5 passed on December 19, 2014 by the Ohio General Assembly, and in accordance with Ohio Revised Code Section 718, we will be publishing our Interest Rates here. Interest Rates for 2016 and forward are based on the Federal Short Term Rate published in July, rounded to the nearest whole number plus 5%. ► Please be aware that this form is NOT being transmitted electronically. The utility desk handles billing and service requests for municipal water, sewer and electric services. If you are moving into or out of a residence in Clyde, you must notify the utility office prior to the move in order to sign up for utility services or to schedule a final reading on your existing account. Utility inquiries should be directed to Patrica Rusch at (419) 547-0575. All utility bills are due by the 20th of each month. If you choose to pay after the 20th, you must pay the "gross amount due". Utility bills are mailed out between the first and fifth of every month. Meters are read between the 8th and the 20th. If you do not receive a bill by the 8th of the month, you can call the office to get your balance. YOU ARE STILL RESPONSIBLE FOR THE BALANCE EVEN IF YOU DO NOT RECEIVE A BILL IN THE MAIL!! If a bill is not paid by the end of the month it is due in, a shut off-notice will go out. Shut-offs are done on the second Wednesday of the month. Shut-offs can only be paid at our office. GO-PAPERLESS and receive your monthly utility billings by email. You may choose to discontinue your paper bill in the mail. Contact the utility billing office in person or call Patrica Rusch to link your email to our utility system (419) 547-0575. ONLINE UTILITY BILL PAY - The City of Clyde is looking at options to provide online bill pay services and access to billing and usage histories. Please see the bottom of a future utility bill for new information on the service. ► Clyde Finance Department 24-hour drop box located in the left lane of the drive-thru on the south side of the building. ► We offer FREE automatic payments from checking accounts for utility bills. Application forms are available at the finance office, a voided check is needed with the application. Payment extensions are only available twice a year, one plan every six months. An appointment must be set up with the finance director who decides if a payment plan can be given. Customers should plan ahead. January shut-offs are affected by this policy.